We have an immediate opening in the Circulation Department for a person to support our service and sales initiatives. Recruiting and maintaining the carrier delivery force. Insuring that all routes are delivered on time every day. Delivering open routes as necessary. Handling customer concerns in a timely manner. Working with carriers to meet sales goals. Keeping and maintaining computer records. No experience necessary! We are looking for someone who is willing to be trained. Contact us if you are energetic, able to work independently, and work well with people. Weekend and night work is required. The position requires office and fieldwork. A general knowledge of this area, a valid driver's license, a good driving record, and a reliable vehicle are required. Competitive salary, mileage reimbursement, benefits package and paid vacations. 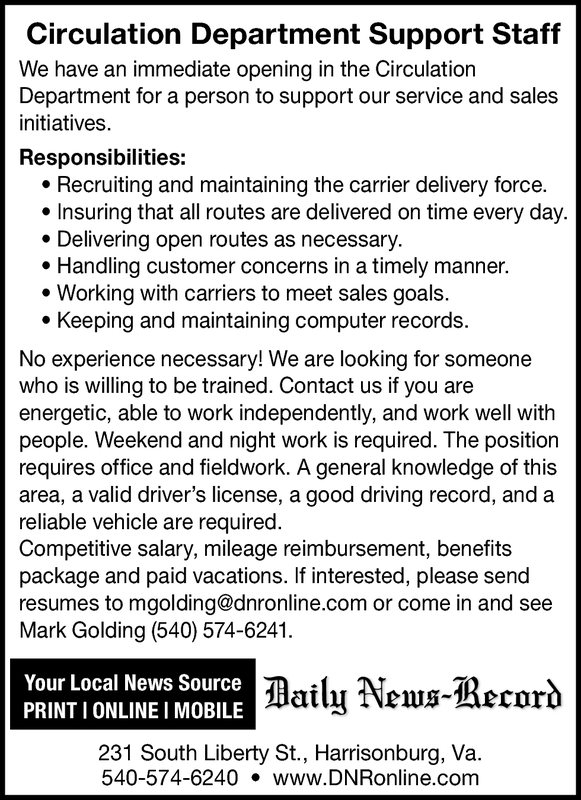 If interested, please send resumes to mgolding@dnronline.com or come in and see Mark Golding (540) 574-6241. 231 South Liberty St., Harrisonburg, VA.